If you need it faster select Express delivery at checkout. 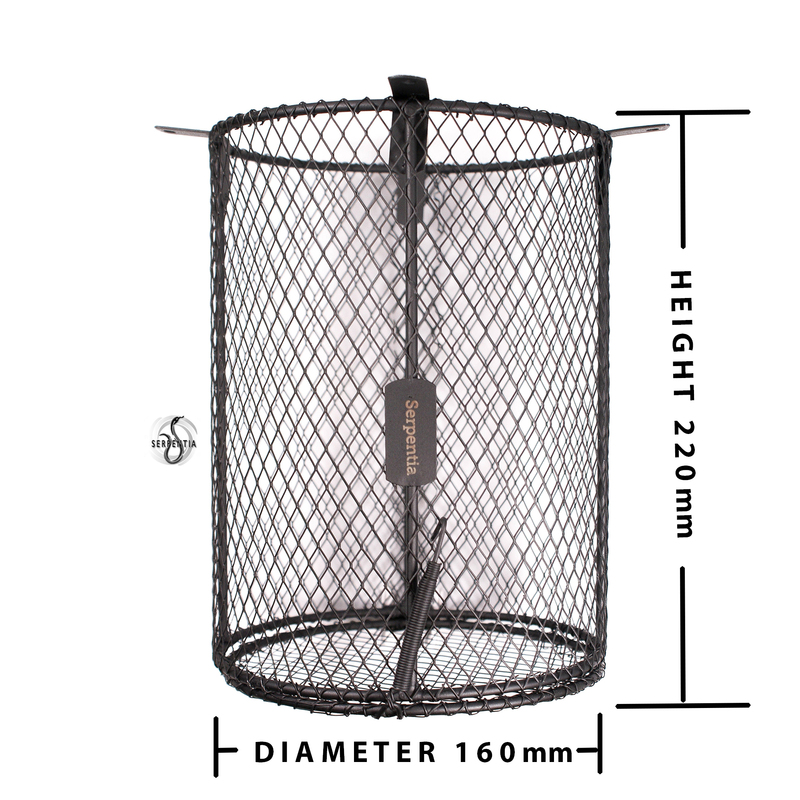 The Serpentia Large Round Reptile Heat Lamp Safety Cage is a high quality easy to use, stylish product that fits simply over a lamp / ceramic and the holder. The guard is designed to accommodate even the largest Ceramic heater. Ideal for medium to large cages and enclosures and larger ceramic heaters and fits up to 250W. Safe for both ceramic lamps and lights. This is a large guard ensuring that your holder and heat / light bulb source fit comfortably within. The Serpentia Heat cage is an essential item for all heating lamps when used inside of a vivarium. It has a spring operated door on the bottom to allow for quick and easy access to change the lamp with secure hook which secures the bottom access door securely and has 4 flat eyelets for fixing screws and to ensure the guard is mounted securely. Bottom access door makes changing your bulb / ceramic easy. Easy to use and versatile lamp holder. The sleek design allows a lamp to be fitted into a vivarium quickly and easily. The Pro Lamp Holder has been designed to be used with the Serpentia Heat Lamp Safety Guard to stop animals coming in to direct contact with the heat source. A sophisticated pulse proportional thermostat is ideal for controlling higher power ceramic heaters and for heat mats, where constant warmth and not an On/ off cycle is required. The function of this thermostat is far more sophisticated than the simpler on/off switching devices. It will very accurately control heaters and has a maximum load of 600 watts. A normal thermostat switches a heater on full power until the set temperature is achieved. It then switches the heater off completely until the temperature drops below the set value, when the cycle starts over again. The gap between the heater being switched on and then off is called hysteresis. It is between these points that the accuracy of the controller is assessed. The pulse proportional thermostat pulses electricity to the heater all the time, resulting in constant and very accurately managed warmth. HabiStat Black Magic Ceramic Heater is a very effective heaters for medium to larger cages with higher temperature requirements. Precautions. Ceramic heaters operate at very high surface temperatures so caution should be exercised. Guard the heater from direct contact by both you and your animals. Use a heater of the correct Wattsage for the size of cage and the temperature required. A HabiStat pulse proportional thermostat is the recommended controller for this heater.